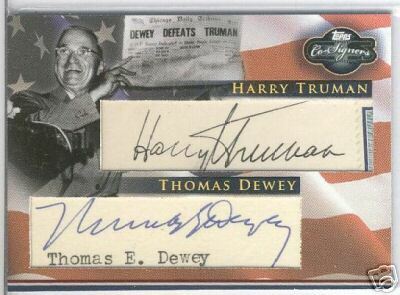 Here’s a dual cut of President Harry Truman and the man who ran against him, Thomas Dewey. If you were paying attention in history class in elementary school, you may remember the story of the Truman/Dewey election. In 1948, the Chicago Tribune mistakenly projected Dewey as the winner of the Presidential election and printed “Dewey Defeats Truman” on its front page. The iconic picture of Truman holding a copy of the newspaper can be seen on the card. I love Presidential cuts and this one is particularly interesting, in that it features both candidates from an election that will be remembered forever. So there’s the good. As for the bad…. 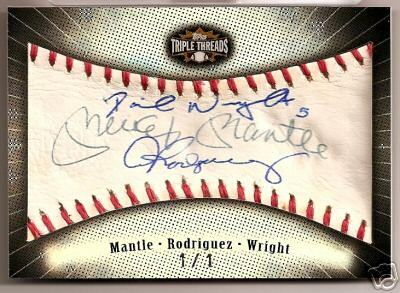 Topps continues its tradition of turning cards that should be awesome into ugly abominations. Well thats it for now. I still need some time to get back into the swing of things and then its full steam ahead! This entry was posted on Wednesday, May 21st, 2008 at 12:46 pm	and is filed under News. You can leave a response, or trackback from your own site. 2008 Topps baseball has three versions of the card and I would like to know what the difference is or which card is A,B, and C. I have two versions and one has Guilani in it and one does not. I assume that this is A and B, but how do I know. Up to Friday’s close of 37. And on top of that you are as well furnished with 7 extra books which might help you take care of yourself naturally.S. This really is certainly a remarkable time we are at the moment residing in, and it’ll be tremendously engaging to view where exactly engineering usually requires us from here. Several have been established to result in ADHD, Diabetes, Autism, even Cancer, birth defects, nerve harm and genetic mutations!